Rob Justin Hulls (born 23 January 1957) is a former Australian politician who was a member of the Victorian Legislative Assembly from 1996 to 2012, representing the electorate of Niddrie. As well as serving as the Deputy Premier of Victoria, he was also the state Attorney-General and Minister for Racing. Rob Hulls was born in Melbourne and was privately educated at Xavier College from 1969–72 and then moved to the private Peninsula School from 1973–75. Upon leaving school Hulls worked as a law clerk for his father, Francis Charles Hulls, who owned the firm Frank C. Hulls & Co, in La Trobe Street, Melbourne. He completed the part-time Articled Clerk's programme at the then Royal Melbourne Institute of Technology in 1983. Hulls was then a Solicitor for the Legal Aid Commission of Victoria from 1984–86. He was also a partner in the law office of Vic Moffat, Solicitors, Mount Isa from 1986–90. Rob Hulls served one term in Federal Parliament from 1990–93 as the member for Kennedy, Queensland. He succeeded the long-standing National Party member Bob Katter Sr., who had retired from politics (he died just prior to the election). In 1993, he was defeated by Bob Katter, the former member's son, who had been a minister in the Bjelke-Petersen, Ahern and Cooper ministries at state level in Queensland. The race was very close throughout, and was only decided on the eighth count when a Liberal candidate's preferences flowed overwhelmingly to Katter. Rob Hulls left Queensland soon after the losing his Federal Parliament seat, and in 1994 on returning to Melbourne was appointed Chief of Staff to the Victorian Opposition Leader, Jim Kennan, former Attorney-General, who resigned from State Parliament shortly afterwards. Rob Hulls stayed on as Chief of Staff under Kennan's replacement John Brumby, who was Premier from 2007–2010. Following his election to the State Parliament, in the lower-house seat of Niddrie, Rob Hulls' replacement as Brumby's Chief of Staff was Julia Gillard, who later in her own career became Australia's first female Prime Minister (2010–13). In his state political career Rob Hulls held the offices of Attorney-General; Minister for Manufacturing Industry and Minister for Racing from 1999–2002; Minister for WorkCover from 2002–2005; Minister for Planning January 2005 – December 2006; Minister for Racing from December 2006 – November 2010 and Minister for Industrial Relations from December 2002 – November 2010. As Attorney-General, Rob Hulls instigated significant changes to Victoria's legal system which saw the establishment of the state's first Charter of Human Rights and reform to Victoria's Upper House. He established special courts for Victoria's indigenous community and introduced an open tender process for applicants to Victoria's judiciary. He was unsuccessful in a campaign to defrock the legal profession and ban the wearing of wigs in courts, a move that was actively opposed by the Victorian Bar Association. Rob Hulls was quoted as saying that "members of the legal profession could continue to wear wigs in the privacy of their homes if they so wished but the wearing of wigs by the legal profession in the 21st century was outdated and elitist". 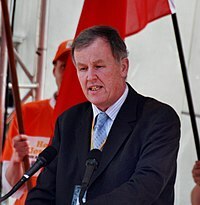 He was appointed as Deputy Premier to John Brumby on 30 July 2007 after the retirement of John Thwaites, and retained the position as Attorney-General until his party's defeat at the election on 27 November 2010. On 27 January 2012, Hulls announced he was resigning from parliament. This triggered a by-election in the seat of Niddrie. Hulls married twice and lives in Strathmore with his second wife and has four children. Rob Hulls is a very keen supporter of the Geelong Football Club. ^ "Division of Bowman". Federal election, 1993. Adam Carr. 13 March 1993. ^ Ly, Linh (27 January 2012). "Labor deputy leader Rob Hulls resigns". Moonee Valley Leader. Archived from the original on 31 December 2012. Retrieved 27 January 2012. Victorian Labor Party website, Biography of Rob Hulls, Retrieved 30 November 2010. This page was last edited on 21 January 2019, at 10:56 (UTC).